For using standard audiofiles I needed to build a stereo musicplayer anyway. To have a good sound with a mono device, the music must be compressed to one channel. this means each file must be converted before uploading it to the players SD card. Like most of my small diy projects i decided to use an arduino as base for the player. I combined it with adafruits mp3 shield and a self welded button panel. The 12 button panel works with 12 resistors which are bridged if a button is pressed. With this technique its possible to measure the voltage on one of the arduinos analog ports and to decide which button was pressed. A circuit plan can be found here or by searching for “arduino button keyboard resistor”. As you can see in the Images, I added two input resistors which helped to get better measurement values. The concept of operation is easy: 10 Buttons represent a folder/playlist on the SD card, Button 11 jumps back, Button 12 jumps forward. If the AdaBox is switched off, it stores the actual played file on the sd card. If it’s switched on, it starts playing with the last file. 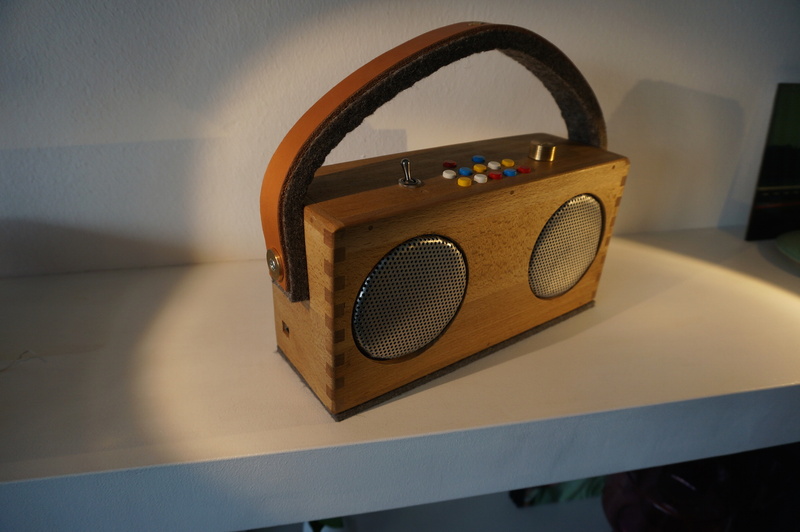 * Software for the ABox - a Hoerbert inspired music player for children. * if a button is pressed. For more infos search for "arduino button analog resitor"
* Usage of the player: The SD Card must contain 10 Directories with music files. * Button 1-10 starts playing the music in the correspondent file.